Here we go… headfirst into another season heralded by our 2014-15 edition of Thirty Reasons We Love College Basketball, our annual compendium of YouTube clips from the previous season completely guaranteed to make you wish games were starting tonight rather than 30 days from now. Over the next month you’ll get one reason per day until we reach the new season on November 14. We’ve captured what we believe were the 30 most compelling moments from last season, some of which will bring back goosebumps and others of which will leave you shaking your head in astonishment. For all of this year’s released posts, click here. #17 – Where Dunks of the Year Happens. We also encourage you to re-visit the entire archive of this feature from the 2008-09, 2009-10, 2010-11, 2011-12, 2012-13 and 2013-14 preseasons. Walker Carey (@walkerRcarey) is the NCAA Tournament’s Midwest Region correspondent. He filed this report after #8 Kentucky’s 74-69 win over #4 Louisville. RTC will be providing wall-to-wall coverage of the Sweet 16 and Elite Eight. Julius Randle has been as advertised this season (sportsillustrated.cnn.com). The atmosphere was unbelievable and the game lived up to the hype. The build up for the Sweet 16 edition of the Battle for the Bluegrass rightfully garnered a ton of national attention leading up to the tip. And boy, was it worth it. Lucas Oil Stadium was overtaken by Louisville and Kentucky fans. Red and blue were all over the place and both factions were loud and involved throughout the night. The game, itself, was a nail-biter to the very end. Both sides were living and dying with every possession and that made for an amazing atmosphere. When Kentucky emerged victorious, the Kentucky section acted as if a weight had been lifted from its shoulders. On the other hand, the Louisville fans were heartbroken over the close lose to their bitter rivals. Free throw shooting and rebounding did Louisville in. In a close game like Friday night, you can often pinpoint factors that played a big role in deciding the game. Those two factors in Louisville’s loss were its poor free throw shooting and inability to keep Kentucky off the offensive glass. The Cardinals were just 13-of-23 (including 6-of-15 in the first half) from the free throw line. Included in that statistic was that senior standout guard Russ Smith went just 4-of-10 from the charity stripe. Louisville also struggled keeping Kentucky’s bigs off the rebounding glass. The Wildcats out-rebounded the Cardinals 37-29 and gathered 15 offensive rebounds that led to 18 second chance points. A huge Kentucky offensive rebound came at the 2:11 mark when sophomore forward Alex Poythress grabbed a putback and converted a three-point play to turn a 66-63 deficit into a 66-66 tie – and that helped set the stage for the Wildcats to ultimately grab the lead and get the victory. The most intense rivalry in college basketball renews Friday night in Indianapolis when Louisville and Kentucky square off in the NCAA tournament for the second time in three years. C.D. Bradley, who writes about the American for RTC, and Brian Joyce, who covers the SEC, preview the showdown and what it means to the basketball-mad bluegrass state. C.D. Bradley: A lot of people will tell you that Duke and North Carolina is the top rivalry in college basketball, but it’s impossible to convey the ever-present antipathy between red and blue. A big part of it is the usual once-a-year nature of the rivalry, but this will be the sixth time Louisville and Kentucky have met in the NCAA Tournament. 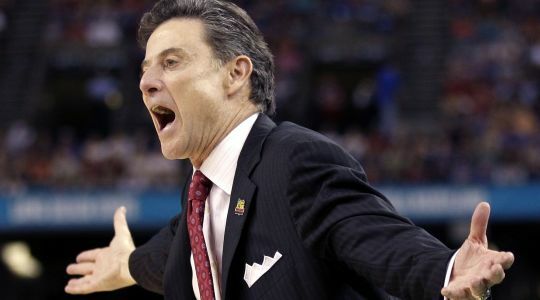 For Louisville, which had snatched the advantage over the past year, winning a national title and ending this season in the top five of the national rankings while the Wildcats struggled, the possibility of having their potential repeat title run ended by their neighbors to the east is a doubly unpleasant notion. What does this game mean for UK fans? Rick Pitino clashes with in-state rival Kentucky and its coach, John Calipari yet again (AP). Brian Joyce: One might assume that Kentucky fans would be relieved to make a Sweet Sixteen appearance after losing to South Carolina and Arkansas a month ago, but a person with that theory must not know Kentucky fans very well. A win over Wichita State has the Big Blue Nation in a frenzy over the potential of their Wildcats if things come together like they did on Sunday afternoon in Saint Louis. 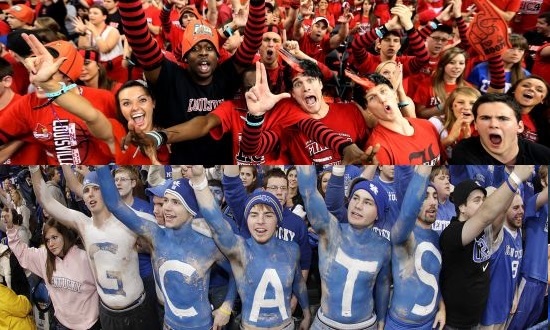 It may even be possible that Kentucky fans are slightly overlooking Louisville. 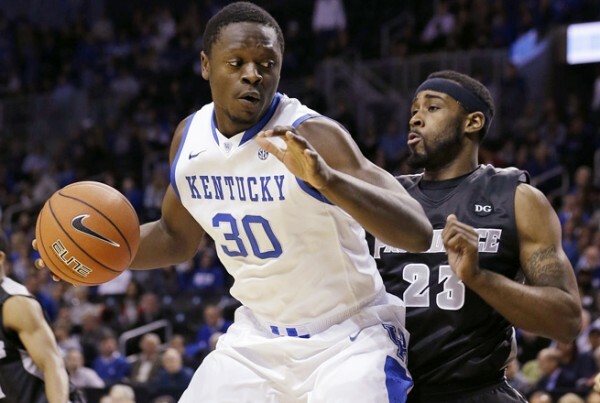 Julius Randle played all of four minutes in the second half of the Wildcats’ victory in December after dominating with 17 points during the first 20 minutes. The Cards struggled with Randle and Kentucky’s length, and while Louisville is a much different team at this point in the season the challenge of stopping the Cats’ imposing front line remains. Since John Calipari arrived in Lexington he has beaten his rival in five of the last six meetings, and Kentucky fans expect that trend to continue. Walker Carey (@walkerRcarey) is the NCAA Tournament’s Midwest Region correspondent, and Brian Otskey (@botskey) is the NCAA Tournament’s East Region correspondent. Make sure to also follow @RTCMidwestRegion and @RTCEastRegion for news and analysis from Indianapolis and New York City throughout the weekend. Tennessee was not supposed to be in this position. It barely found its way into the NCAA Tournament. In fact, the Volunteers had to travel to Dayton last Wednesday to take on Iowa to even advance to the round of 64. Tennessee got by the Hawkeyes in overtime and that was only the beginning of its winning ways. In Raleigh, Cuonzo Martin’s squad was able to throttle Massachusetts and take advantage of Duke’s stunning loss to Mercer by dismantling Bob Hoffman’s Bears in the round of 32 to advance to the Sweet 16. Leading the way thus far for Tennessee has been the spectacular play of forward Jarnell Stokes. The junior has been nothing short of dominant in the team’s recent run, as he is averaging 20.3 points and 15 rebounds in his last three games. The Volunteers have also received a lift from guard Josh Richardson. The junior, who averaged 10.1 points per game in the regular season, has stepped up his play in the tournament, as he is averaging 19.3 points per contest. As a team, the Volunteers’ performance on the rebounding glass has aided tremendously in taking them to the Sweet 16. Tennessee has been an excellent rebounding team all season and its rebounding prowess was never more on display than in Sunday’s victory over Mercer. The Volunteers had a sensational 41-19 rebounding advantage over the Bears in the winning effort. Michigan will take the court in Indianapolis after a relatively easy first weekend in Milwaukee. The Wolverines cruised to a 17-point victory in the round of 64 over an undermanned Wofford squad before wearing down Texas in a 14-point victory. John Beilein’s team has been an outstanding perimeter shooting offense and that has carried over into the postseason. The Wolverines hit a combined 21 three-pointers in the two victories. Big Ten Player of the Year Nik Stauskas hit seven of those 21 triples an was the team’s leading scorer in each victory. Michigan’s frontcourt has been seen as a concern since sophomore big man Mitch McGary was lost to a back injury in late December, but forward Jordan Morgan showed he is a capable post presence with his performances in Milwaukee. The senior averaged 12.5 points and 10 rebounds against Wofford and Texas, while living up to his reputation as a solid interior defender. In Friday’s game, it should be expected that both teams will play to their strengths. Tennessee will try to use its size advantage to the dominate the interior and Michigan will attempt to get its perimeter shooting going early and often. Texas had a great advantage over Michigan in size too, but the Wolverines were able to wear the Longhorn bigs down through a terrific transition effort and solid offensive spacing. It would be wise to expect Michigan to do the same Friday. Tennessee will keep close throughout much of the game, but the shot-making ability of Stauskas, Caris LeVert, and Glenn Robinson III will ultimately be too much for the Volunteers to overcome. Two-seed Michigan will win the game to advance to its second straight Elite Eight. When the next AAC Morning 5 is published, only four teams will remain to vie for a national championship. Will an AAC school be one of them? Both AAC squads still remaining, Louisville and Connecticut, will hit the floor in their respective regional semifinals tonight. While Louisville will face a familiar foe in Kentucky, Connecticut will experience some familiarity of its own by playing in Madison Square Garden. It will be a nostalgic night for the Connecticut faithful, especially for former coach Jim Calhoun. Calhoun built Connecticut into a basketball power after taking over the program in 1986 and had great success in the Garden. Last year on the way to a national championship, Louisville guard Russ Smith could lean on the play of big man Gorgui Dieng and backcourt mate Peyton Siva. Those two have since moved on to the NBA, but that doesn’t mean Smith isn’t getting help from them. Smith said he talks almost daily with the two, mainly asking for advice about leadership. “It’s been really tough not to have them on the court with me,” he said. “They helped me so much last year.” Siva took Smith under his wing from the moment he stepped on campus. Siva’s advice to Smith: Don’t stress what other people are saying and just play your game. Dieng said Smith needed to stand up if something was going bad and now he understands and does so. Louisville assistant coach Kevin Keatts will be the next head coach at UNC-Willmington, unless of course, he didn’t actually graduate from college. It marks the fourth assistant-to-head coach move in four years from Louisville. He is known as one of the best recruiters in the game and played a large role in signing Montrezl Harrell, Luke Hancock, Chris Jones and Terry Rozier, all players that will be a major part of the Cardinals’ Sweet 16 game tonight with Kentucky. Keatts was also instrumental in the landing of the Louisville 2014 recruiting class headlined by guard Quentin Snider. Sean Vinsel of cardsandcatsstats.com welcomes the Sweet Sixteen match-up between Kentucky and Louisville. The Indiana grad’s website breaks down both teams statistically using measures not usually seen in the college game such as NBA’s plus/minus system. Louisville’s most productive line-up according to Vinsel is Chris Jones, Russ Smith, Wayne Blackshear, Montrezl Harrell and Stephan Van Treese. Kentucky’s is the Harrison twins, James Young, Alex Poythress and Willie Cauley-Stein. The X-factors, he said, will be Luke Hancock and Cauley-Stein. Larry Brown said SMU owes everything to its fans. The Mustangs faithful made NIT home games feel like regular season finales with a conference championship on the line. SMU won 12 out of 13 games at Moody Coliseum this season, including the third round NIT victory over California, securing a spot at Madison Square Garden. “I think it plays a big part,” Senior Shawn Williams said of the crowd. “Those five-or-six-point runs turn into 10-or-12-point runs with the crowd.” The Mustangs were hoping for an NCAA Tournament berth, but a chance to play three more games at home wasn’t a bad consolation prize. Walker Carey (@walkerRcarey) is the NCAA Tournament’s Midwest Region correspondent, which begins Friday night at Lucas Oil Stadium in Indianapolis with Tennessee vs. Michigan followed by Louisville vs. Kentucky. The South Regional Reset and the West Regional Reset published yesterday, and the East Regional Reset will release later today. Make sure to also follow @RTCMWRegion for news and analysis from Indy throughout the week. New Favorite: #4 Louisville. The new favorite is the old favorite, but after the first four days of Tournament action, determining a favorite was not an easy task. Louisville was pushed to the brink by #13 seed Manhattan in its first game before needing a late flurry Saturday to race by #5 Saint Louis. The Cardinals still appear to be the best team in this region, but they are going to need to be sharper in Indianapolis than they were in Orlando if they want to advance to their third consecutive Final Four. To be sharper, Rick Pitino’s squad is going to need guard Russ Smith to elevate his play. The senior has struggled thus far, shooting just 6-of-19 from the field and committing 13 turnovers over the first two games. The intensity in Indy Friday evening should be at an all-time high. Horse of Darkness: #11 Tennessee. For the third time in the four years of the First Four, a team has won three games to advance to the Sweet Sixteen. Tennessee will arrive in Indianapolis after a win over Iowa in Dayton and wins over #6 Massachusetts and #14 Mercer in Raleigh. The Volunteers showed during those three wins that they are a very tenacious defensive team and possess a bruising tandem in the post with forwards Jeronne Maymon and Jarnell Stokes. The most amazing part of Tennessee’s run to the second weekend might be that Volunteers head coach Cuonzo Martin had been viewed as someone on the hot seat late in the regular season. There was even a faction of the Volunteers fan base that banded together to try to get the school to fire Martin and hire former coach Bruce Pearl. You have to wonder what those fans are thinking now, as the team is headed to the Sweet Sixteen, now with Martin at the controls.